Pepperoni, of course! 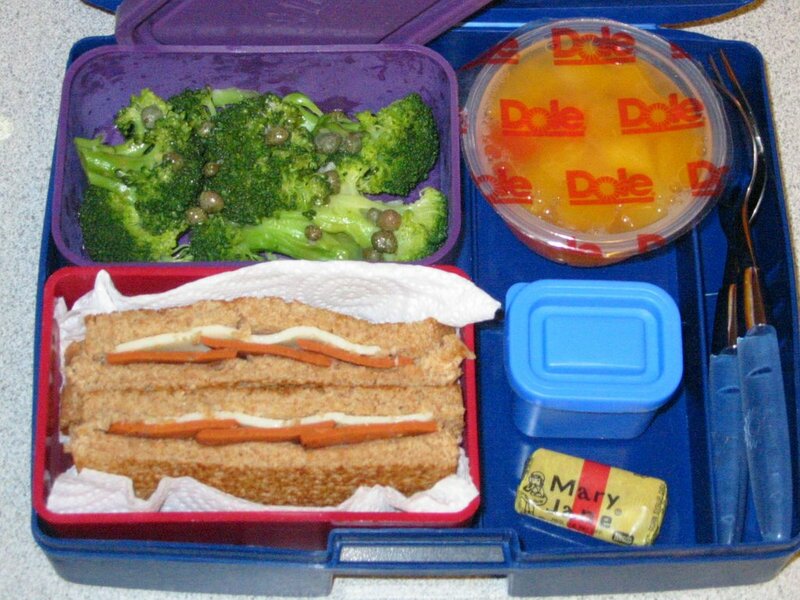 I measured the inside of the lunchbox to make sure the pizzas would fit just right -- too cute! 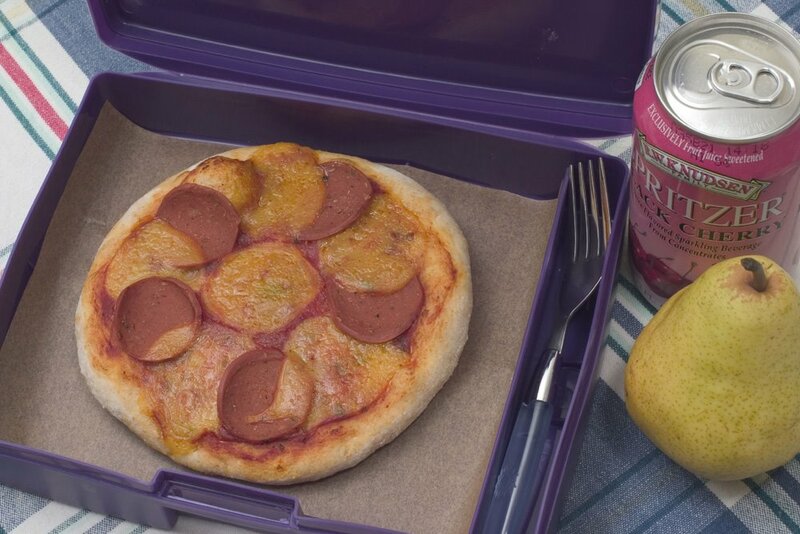 I've never sent shmoo to school with a soda before but a fruit-sweetened spritzer seemed just right with pizza. I tucked an organic pear in his backpack wrapped in a napkin, too. Verdict: He even ate the crusts! And hubby and I ate our crusts, too, when we enjoyed the rest for lunch. 5 stars. Here's a sandwich of seitan slices with vegenaise on wheat bread, with a lime soy yogurt, green beans, and a dried apple and blueberry bar. 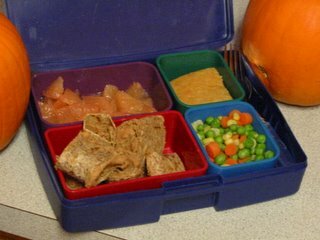 Verdict: I waded through an ocean of crusts (oh, those cursed crusts...) only to discover that the shmoo had once again left all his containers and untensils in his desk at school. The napkin was still there, though! But he ate everything and especially liked the apple bar. 4 stars. Today's lunch photo features the awesome napkins that super-mom Dionne made for Little shmoo's lunches. Thanks again, Dionne -- they are the best! Today's lunch is macaroni & peas with a basil-flecked nutritional yeast sauce, an organic apple, some baby carrots with extra mac & peas sauce for dipping, and some chocolate letter cookies. Verdict: This is a repeat of one of Little shmoo's all-time favorite lunches. He can eat bowls and bowls of this and never get tired. 5 stars. Here's something the kids will be thankful for: Native Blend Popcorn Balls. 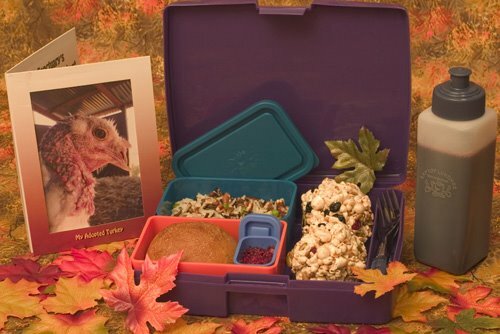 Here is a Thanksgiving lunch box inspired by foods we eat today that are native to North America (listed here in bold). A pumpkin Anadama roll filled with tofurkey and vegenaise, cranberry sauce in the tiny container, wild rice pilaf with peas, corn & pecans, popcorn balls (popcorn was served at the first Thanksgiving!) 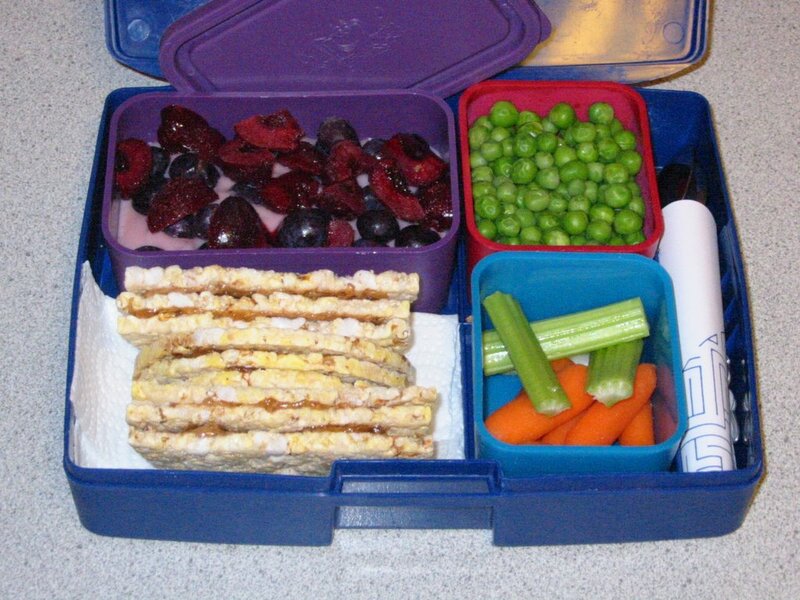 with sunflower seeds, pumpkin seeds, dried cranberries, and dried blueberries. Beverage: concord grape juice. Verdict: My husband took this fancy-pants picture for the cookbook. Our adopted turkey, Ingrid, is looking adorable and thankful in the background. Little shmoo loved the wild rice and the tofurkey roll, but doesn't care for cranberry sauce. All three of us can't stop eating these chewy, carmely popcorn balls. 5 stars. A lunch chosen and prepared entirely by Little shmoo. He even took the picture, with pumpkins added as "perfect decorations". 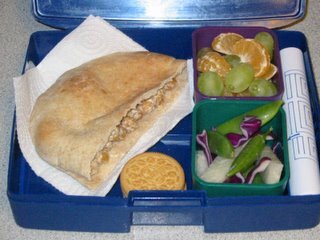 A whole wheat tortilla rolled up with refried beans and cut into bites, grapefruit segments, cooked peas, carrots, and corn, and a piece of vanilla cake. Verdict: He loved his lunch (5 proud stars), and I loved having him in the kitchen this morning, chatting as he chopped carrots, spread beans, and scored a grapefruit (which took him about 10 minutes!). "I'm going to eat the grapefruit first," he told me, "that cake can wait!" Then a while later (still scoring) he said, "I'm tired of the people in my lunch group. They eat meat every day in their lunch, and when I see it I think, 'there's one less animal in the world'." Oh, it hurt to hear this and I didn't know what to say. It made me feel sorry and sad, sorry that I've opened his eyes to see a dead animal where other kids just see food, sorry that I send him out on his own every day to face it in a way I don't have to. A veggie burger made from "Nature's Burger" by Fantastic, on a wholegrain sprout bun with a slice of Tofutti cheese. Organic green grapes, baby carrots with some cannellini bean hummus, and some pretzels. Verdict: I'm happy with these burger patties. They come in a dry mix that you add boiling water to. The main ingredients are brown rice and mixed dried vegetables, which I feel better about than the usual processed soy patties. They stay tender and don't get rubbery when cold like the Bocas, and best of all Little shmoo liked them, too! He ate well over half the burger, all the grapes and carrots with dip. He didn't touch the pretzels, which is probably healthier than eating them! 4 stars. 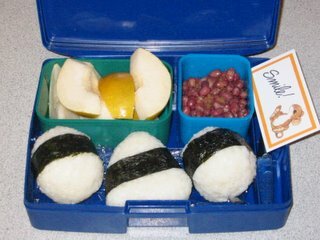 Three musubi are lined up in the lunch box today. Musubi (also called onigiri) are balls of Japanese sticky rice (that's right, Shannon, James eats sticky rice!) wrapped with nori seaweed and usually stuffed with an umeboshi plum ("You're the ume in my musubi" is a Japanese version of "you're the cream in my coffee"). Along for the ride are some adzuki beans with pickled ginger and soy sauce, and an Asian pear. Verdict: Wow, these are more filling than I thought; we ate one each and were stuffed. I even tried a bit of umeboshi in mine, and boy howdy that's an aquired taste. Little shmoo ate all the Asian pear and most of the beans, too. 3 stars. P.S. Yesterday my mom found these cards that she bought back in the 80's to slip into our lunches (which she never did). They say adorable, sappy things like "You Can Do It!" and "No Matter What I Love You". I'm getting quite a collection of cards -- pickle-shaped jokes, cookie-shaped puzzles, mazes, and now these. Does anyone have any lunch notes they'd like to trade with? 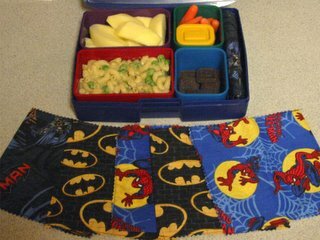 Or how about some of those little cloth napkins that Catherine mentioned below? Email me (jmccann@veganlunchbox.com) if you're interested. 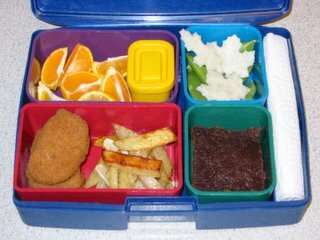 Today was noon release, so no lunch box today (we went out for vegan burritos at Taco Del Mar, woo!). 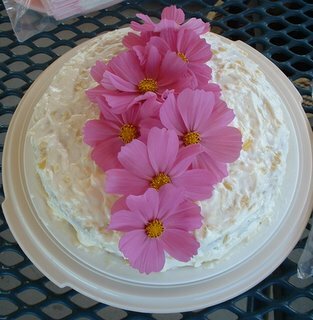 Instead of the regular lunch box, here are pictures of the two birthday cakes I plan to include in the cookbook: Triple Chocolate Cupcakes and Pineapple Celebration Cake. 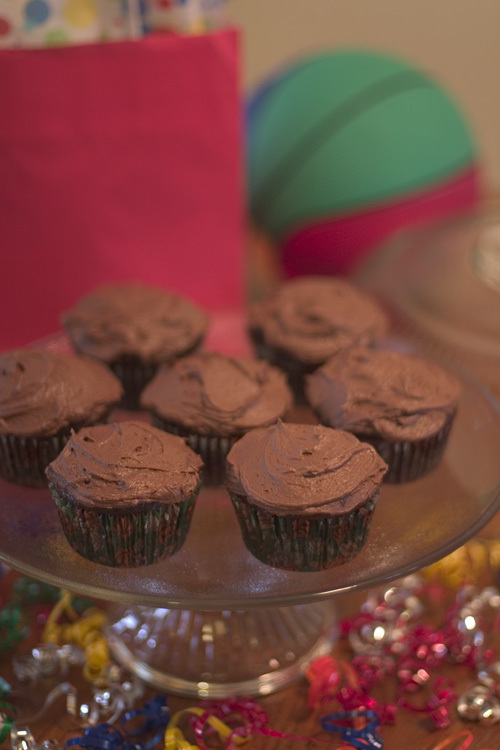 The chocolate cake is so good, even omni members of my family ask for it for their birthday! Little shmoo's birthday is in the summer so he won't be bringing them to school to share, unless we decide to have an Unbirthday Bash. Chickpea salad in a pita pocket, mandarin orange slices and organic green grapes, jicama sticks, sugar snap peas, and red cabbage, and two Golden Oreos for dessert. Verdict: Ha! After I took this picture I slipped the sandwich into a ziplock bag and folded the two Oreos up in a napkin. So when Little shmoo got home he had eaten everything except a bit of pita bread (he really liked these chickeny chickpeas), some of the red cabbage and peas...and the cookies! I unrolled them and held them up to him. "Oh!" he said. This kid needs to learn to use his napkin! 4 stars. Some oatmeal-flax waffles, cut into strips and spread with peanut butter, packed with a little container of maple syrup for dipping; organic blackberry- applesauce (our favorite), and some roasted sweet carrots with cinnamon. Beverage: calcium- fortified orange juice. 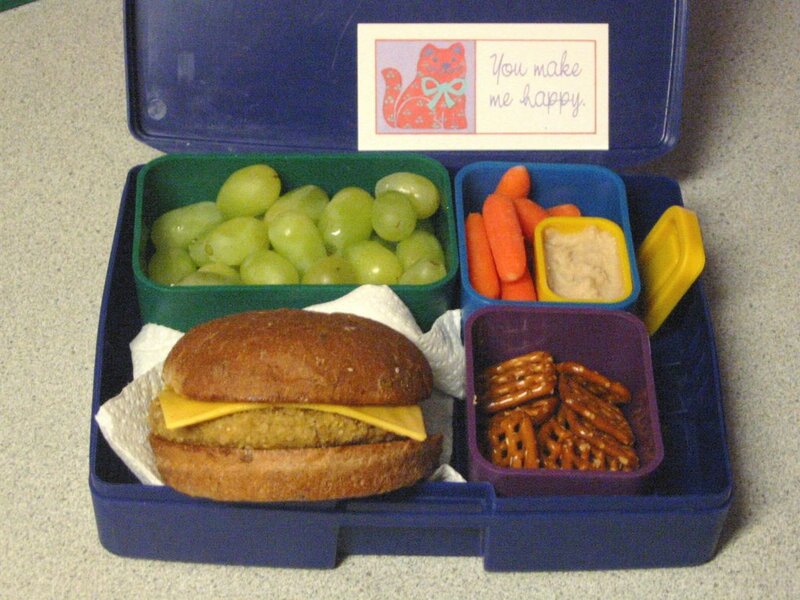 Verdict: Sometimes I'm frustrated by how little time they have to eat their lunch -- 20 minutes. 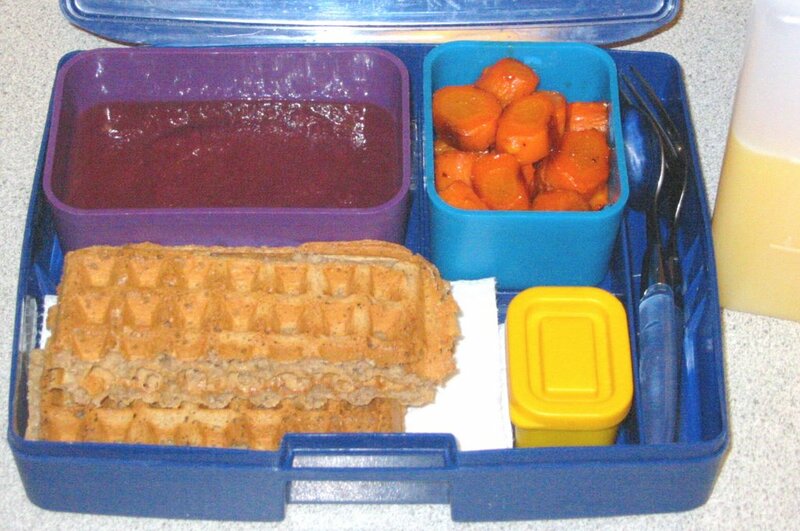 He ate all his waffles and juice and was halfway through his carrots when the teacher told everyone time was up. He ate his applesauce after school. That's one reason why I don't send a lot of beverages; I think he plays around with the bottle, and the liquid fills him up quickly but leaves him hungry later. 3 stars. No school today! The shmoo and I will be heading out to play with friends this afternoon, something we haven't got to do much since he started school. 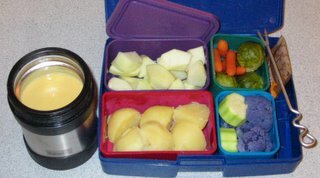 Here's the recipe for my Lunch Box Fondue. We sure loved it. Even my uncheese-hating husband was surprised when he tasted it; he sat up and said, "How did you do this? It actually tastes good!" Surprise! Let me know what you think, and if you have any other fondue dippers to add to my list. Thanks! Some pasta spirals in tomato sauce are kept warm in the thermos. 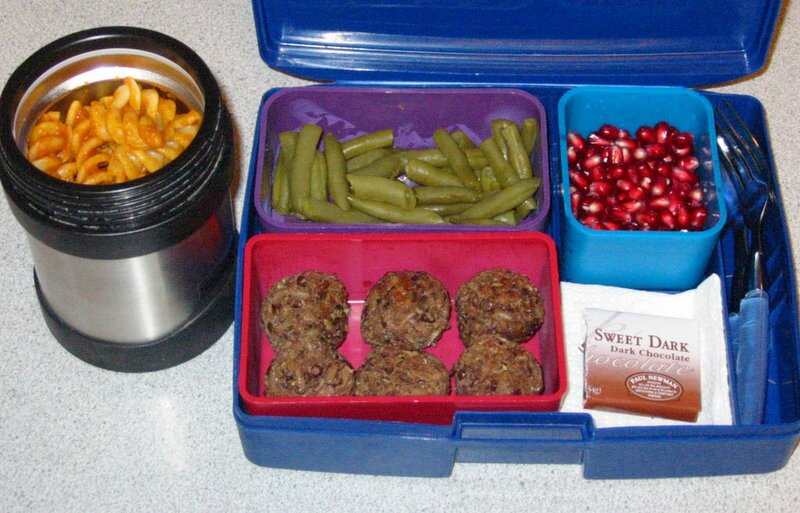 In the lunchbox are lentil and brown rice "meatballs", green beans, pomegranate seeds (did you know pomegranates have more antioxidants than green tea or red wine? ), and a piece of Newman's Own Organic sweet dark chocolate. Verdict: At the last minute I decided to pack an extra little container of tomato sauce for the lentil-riceballs -- they are sooo good with lots of tomato sauce. I packed enough for two since I was planning on being there to have lunch with him, but it turned out the teacher didn't need me today. So of course he couldn't finish it all by himself, but he did eat all the green beans and half the pasta and lentil-riceballs. 4 stars. Three vegan chicken nuggets next to some p.t. fries (p.t. stands for potatoes and turnips). A tiny container of ketchup is nestled next to a mandarin orange cut into wedges. In the two smaller containers are sugar snap peas and jicama cut into fall leaf shapes, and a date walnut carob brownie for dessert. Verdict: We just found these "Health Is Wealth" brand vegan chicken nuggets at the health food store. He likes them, and I was happy that they were all-natural and contained no evil trans fats. He ate a huge plate of the p.t. fries with his breakfast, so there were hardly any left for his lunch. The uneaten remainders today were some of the sugar snaps (he likes to open them and eat the peas out of them -- me, too!) and the mandarin orange, which he ran out of time for. He ate it after school alongside half a pomegranate (it's pomegranate season, hooray!). 4 stars. 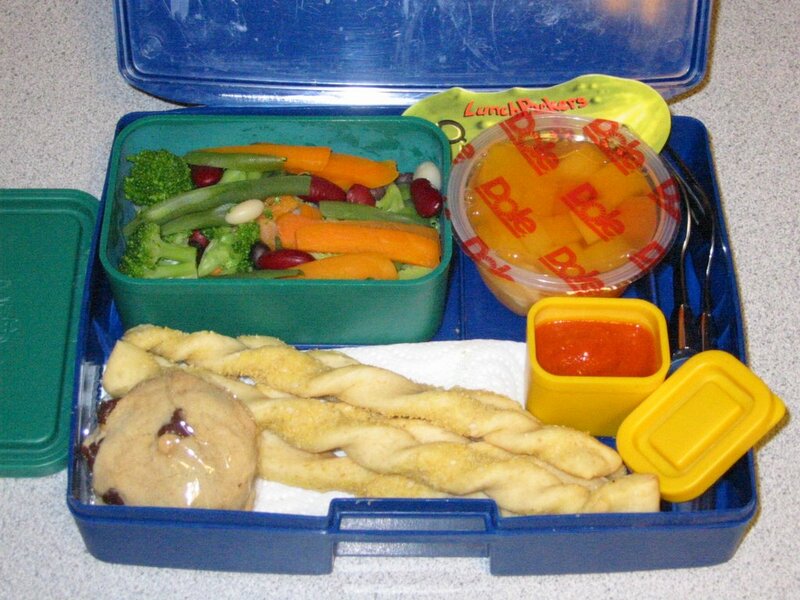 Some twisty breadsticks topped with cheesy-tasting nutritional yeast, alongside some tomato sauce for dipping. The veggies are a frozen mix called "Flavor Fiesta" -- broccoli, carrots, and green, black, white, and kidney beans. 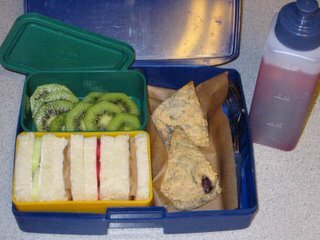 Also tucked in the box are a fruit cup and one chocolate chip cookie (Little shmoo made these himself, with a little help, from the recipe on the vanilla Silk carton. They're good!). Verdict: Little shmoo and Papa shmoo both went crazy over these breadsticks. I made 36 last night, and they're all gone! Little shmoo scarfed down the breadsticks, fruit, and cookie. In the veggie department, he ate every single bean and carrot and left all the broccoli. I have to agree with him, frozen broccoli is not as good as fresh. 4 stars. 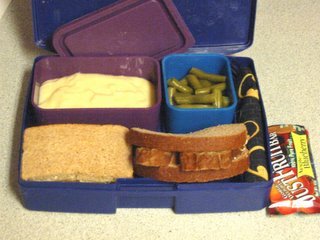 Triple-decker almond butter and peach jam sandwiches on Multigrain Corn Thins (I cut the corn thins in half with a sharp knife before assembling, so they would fit in the lunch box). Cherry soy yogurt topped with frozen blueberries and cherries in the large lidded container, and some green peas, baby carrots, and celery sticks. A maze is wrapped around the spoons (two to prevent "dirty spoon whining", one for the yogurt, one for the peas) for fun. 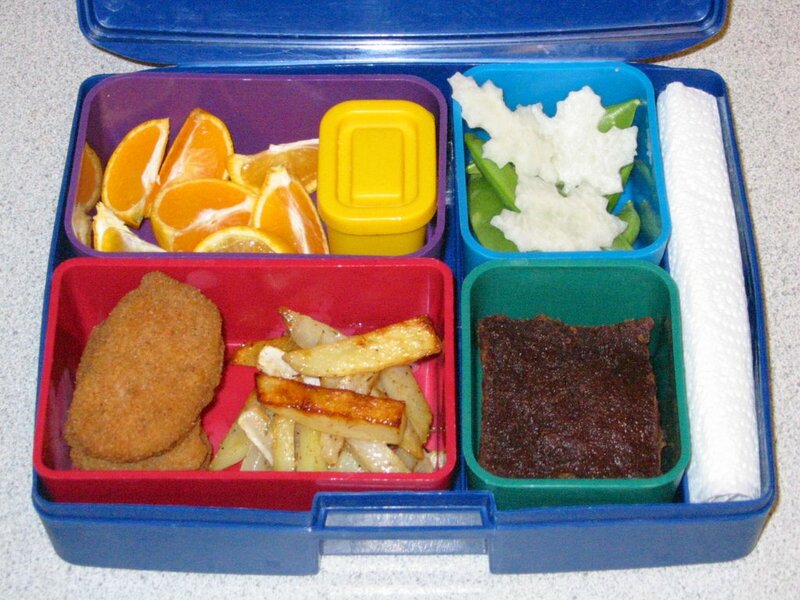 Verdict: A quick, simple lunch on a busy Monday. We like these little corn thins from the health food store; they're like rice cakes. Everything was gone but most of the celery, and I do mean everything -- he left half the empty containers in his desk at school! Luckily I have a backup set. 4 stars. Update: I cleared out his desk today and found two spoons, three containers, a lid, and the core of the asian pear from Halloween's lunch. Eeew! We had a little talk about proper post-lunch hygiene. 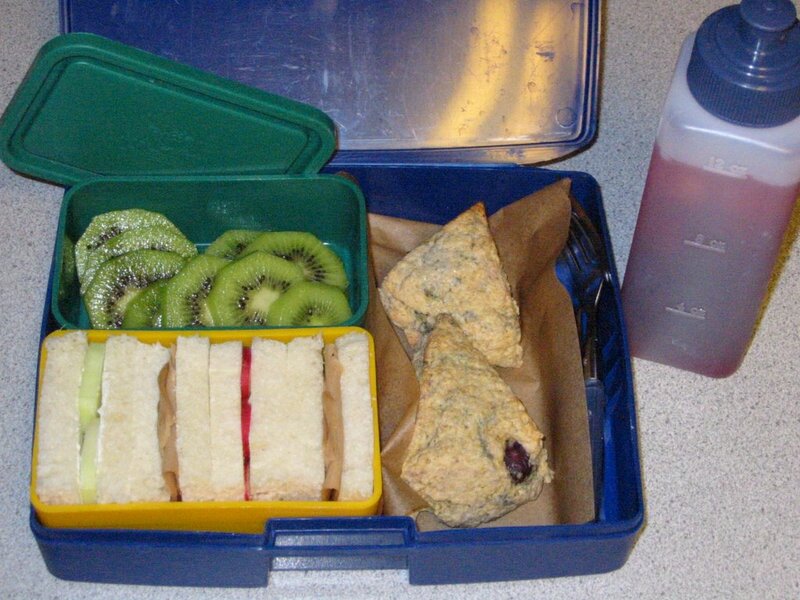 Two blueberry scones, two kiwi fruit, and an assortment of tea sandwiches on storebought English Muffin Bread with the crusts cut off: Tofurkey deli slices with vegan mayo, cucumber with vegan cream cheese, and radish with margarine. Beverage: berry-flavored herbal ice tea with apple juice ice cubes. Verdict: Little shmoo ate half the radish sandwich and half the cucumber sandwich, and only had room for one scone. Everything else was reduced to post tea-time crumbs. He loved having iced tea for lunch. 3 stars. "And then a miracle occured..."
I know this isn't lunch related, but tonight my son ATE A SALAD! An actual salad went in my son's mouth and down his throat -- I saw it happen! He has hated all green leafies -- cooked or raw -- pretty much since he joined planet earth. A shred of lettuce on his burrito is enough to send him into a fit. So tonight there I was, chopping romaine, spinach, and cabbage for what is usually a salad for one (Hubby doesn't care much for salad, either). Little shmoo came into the kitchen and watched for a while without saying anything. He picked up a baby spinach leaf and looked at it, then handed it to me. "I think I could eat that salad if it had a yummy dressing on it," he told me, "and if it had things I like in it, like carrots." Stay calm, stay calm, I told myself. "I think we can do that," I said. I put him to work spinning the lettuce and chopping chunks of baby carrots and apple while I toasted walnuts and thought about the dressing. Combine and whisk with a fork until well-blended. Together we brought the salad and dressing to the table, and I served him up a bowlful. "Mmm, this dressing is my number one dressing," he said as he started in. "So many flavors!" he said a few bites later. I told him salads were like that. He set it aside to eat his spiral pastas with lima beans and rosemary, and I thought that was it. Then he came back to the salad, served himself some more, and ended up eating two bowls. I tried to act encouraging without dancing on the tabletops. I'll probably wait a few days before I make another salad, and I won't be at all surprised if he doesn't like it next time. If this is the only salad he ever eats, that's okay. I'm just glad I was there to see it happen. 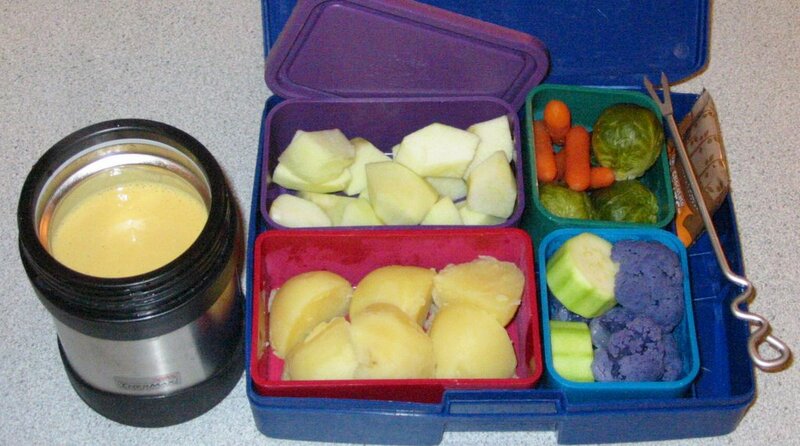 A thermos filled with piping hot vegan fondue today, with several veggies for dipping: boiled new potatoes, raw zucchini slices, lightly steamed purple cauliflower, Brussels sprouts, and baby carrots. Organic apple chunks are in the lidded container. Off to the side is one Endangered Species dark chocolate (half off after Halloween, yeah!). Verdict: Okay, so I didn't really send him to school with the mini-fondue fork (from our chocolate fondue set). 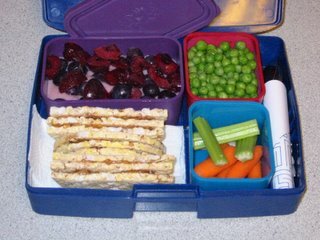 But it looked sooo cute and fit so perfectly in the lunch box, I just had to take its picture. The points are sharp, though, and I didn't want anyone's eye out. He used his regular fork instead. I can tell lunch is going to be a big success when he wants to eat it right away for breakfast. He ran excitedly to his dad to exclaim, "I'm having FONDUE in my lunch today!" He ate all the apple, carrots, and Brussels sprouts, and most of the zucchini, potatoes and purple cauliflower. 5 stars. 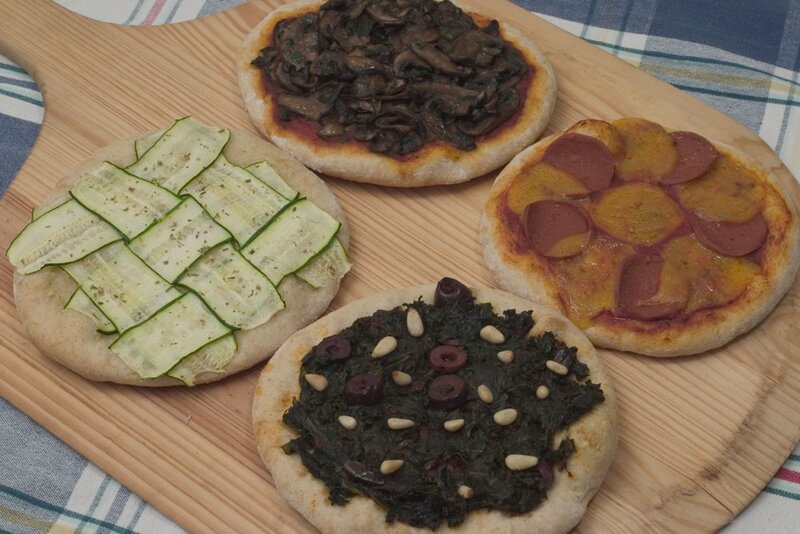 Verdict: This was our first experiment with storebought vegan cheese slices -- we tried Tofutti brand. I'm not too keen, but Little shmoo loved it. Not even a crust was left!! The flavorful lemon sauce helped the broccoli out at lunchtime, a big improvement over plain. The only thing he didn't like? The Mary Jane. Yes -- more for me! 3 stars. 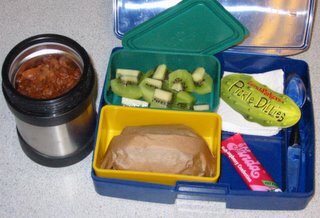 Little shmoo's favorite chili (I call it his "picky chili" -- no onions, peppers, or chunks of tomato) is in the thermos. I cut open a baked potato and wrapped it in parchment paper; at lunch he unwrapped the spud and poured hot chili over it. An organic kiwi fruit (did you know one kiwi fruit has over 100% of your vitamin C?) and half a raspberry licorice are on the side. Verdict: A hearty hot lunch for a cold, rainy day. All the chili and all but a couple bites of potato were gone. He got too full for the kiwi fruit, which he ate as an after-school snack. 4 stars.